Review: I was really nervous about this book. Halo was such a flop (for me), and Hush, Hush has kind of dominated this niche of paranormal romance, so Unearthly was up against some stiff prejudice. But I surprised myself by really liking it. It felt very... real. It wasn't just "I'm an angel, and so I'm so amazing." And it wasn't "HOLY CRAP!! I'm an angel!?! What do I do now?!" Clara was just a regular girl, trying to work with what she had been given. And the love interest was SO CUTE! Everything they did together made me giggle. And I know this book sounds like a love triangle, but it really isn't. Because one of the "love interests" you don't want Clara to fall for (at least, I didn't). But that did make it a little stressful because that love interest kept being forced on her. There was definitely some "religious" stuff in the book. Clara isn't any specific religion. But there are demons, and a brief trip to hell. It didn't bother me at all (and I'm a conservative Christian), but I know some of you are bothered by that so I just wanted to let you know. The only thing I didn't like was the ending. The whole book focuses on one event that is about to happen. It builds and builds and builds, and then finally the event happens! And... then it's over. All of the characters pretty much just say "Okay. See ya later." And they leave. It's not a cliffhanger. It's not a resolution. It's not... anything. So I won't read the next book because the ending made me want to know what happens next, but I'll definitely read the next book for the romance. Thanks for the review! I've been seeing a lot of good reviews for this one and it's gotten me quite excited for the next weeks. We seem to have the same views on this book and Halo. 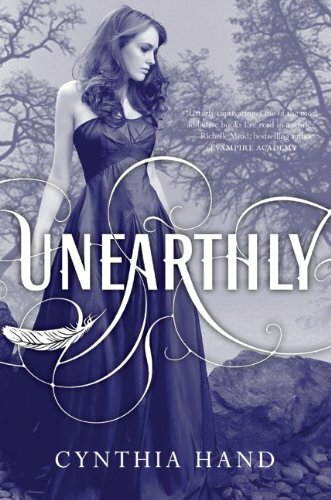 I really like Unearthly. Same kind of feeling for the ending and I'm totally with you about the triangle. It really wasn't one, maybe more because she was rather torn also. Who knows. Great review. Great review! I've been wanting to read this for a while, and I know what your talking about when the book build you up and then it's over :/ I'll still check it out, thanks! PS I did like Halo :) But I feel ua. I just finished this yesterday in one sitting! It was sooo good. I can't wait for the next one to come out. Although I didn't mind that the ending wasn't a cliffhanger. I hate when authors do that and then you have to wait for the sequel. I really liked this book, it had just the right mix of romance, supernatural and friendship in it for me. I am looking forward to the next book not just for more about Clara but also for more about Jeffrey. I think he has some secrets and a story of his own.